I'm the same...For every 10 star pics I take I may end up liking and keeping one. I struggle with all of the issues listed above. My goal is to get more consistent with my images. But hey, if I spend a couple hours in the bush while waiting for a long exposure and it doesn't turn out, that's still a great way to spend a couple hours! Steve, those are absolutely stunning shots and very inspiring. Last year I decided to get a camera nearly 45 years after having taken my last shot in earnest. A DSLR and lenses seemed like too much camera to haul around in the backcountry so I chose a Panasonic FZ200 and wasn't disappointed (given the limitations of a small sensor.) This summer I want to try my hand at starry sky photography. So, as I say, your shots were very inspiring. I have my eye on what looks like a pretty decent travel tripod (Sirui t-025x.) But I'm wondering if there is on-line material or real live books focusing on moon and dark sky photography that you (or others) might recommend that would help me get started with results that will encourage me to keep going. Thanks again for your wonderful shots. Here's a couple of things you can do on the cheaper side if you are handy. but would also give you the chance to get clear star shots. I'll echo the others - amazing photos and it inspires me to learn more about my new camera. I'll echo in another respect, too. I used to shoot with SLR - my dad's old camera and about 13 years ago (just before our daughter was born) bought a more modern SLR with the auto settings. That was in the dying days of film but I didn't quite trust digital yet. Then a couple years later got a p&s digital camera to have in the pocket, then eventually moved toward waterproof point and shoots, and I haven't used the film camera in nearly a decade. But, I've never been too happy with the photos I get from my p&s cameras. Low light shots were terrible, landscape stuff never quite worked out like I wanted - but they are handy to have on hand. So, for Christmas this year my wife gave me permission to go buy a camera. Actually, it was supposed to be an action camera (Contour or GoPro) but I decided a decent dSLR would be far more useful for the 99.99% of the time when I'm not underwater (plus, I still have the waterproof pentax optio and 2 paddling buddies now have gopros). My local Don's Photo had the Sony a6000 on sale and that's what I ended up with. Now comes the long process of learning again about exposure vs. aperture and now with iso added in to the mix. What do you mean I can use an iso of 3200, that's crazy talk. I've been 90% really happy with the camera so far. I was surprised to learn a few things though. Even before I bought it I was disappointed to learn that it will only do a 30" exposure - wondering how the heck I'd do star trails. I since learned, confirmed by your post, that in the digital world we now use the computer to combine multiple shots to get what we are after. I was also disappointed to learn that the camera won't do interval shooting on it's own. That's a feature I use quite a bit on my point and shoot camera - such as at the pool during a lesson I set it up on a tripod at pool side to take periodic photos in the hopes of capturing a snapshot or two that is acceptable. I also will use interval shooting at camp to snap photos of camp life as I go about setting up and so on. 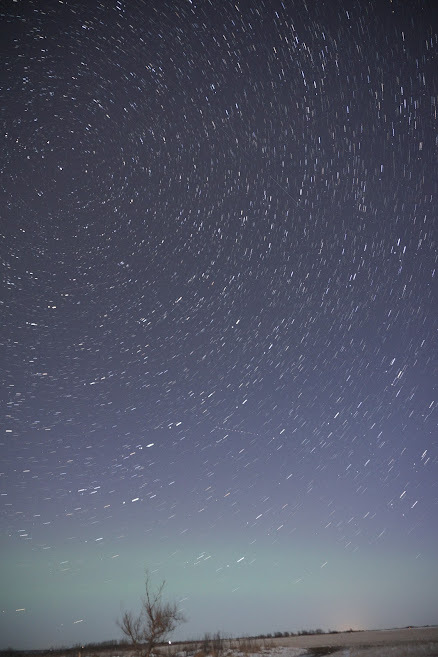 And, of course it's also needed for the star trails. So, I had to add an external remote (this one http://www.amazon.ca/gp/product/B00NSE1 ... ge_o00_s00). Among the things I've really liked so far is the low-light performance. I can snap away indoors without a flash and get really decent snapshots of my family in a natural light that makes the colour look much better than with the flash. And this is with the kit lens that is not particularly fast (3.5). When I bought the camera I could also purchase the 24-210 zoom for much less than it would be otherwise, so I got that too. Plus filters to protect the lenses, plus a spare battery plus something to clean the lenses, plus this plus that - it all get's pricey fast! Not to mention I somehow now have a strange need for a fast wide angle lens when a month ago I hardly had an idea what that was. In other news, my wife has put us on a spending freeze. Took some of Steve's tips out last night, lovely clear crisp -12c. Main stars nice and sharp, did the manual focus like steve said but what your eyes don't see the camera picks up. The comet wasn't visible but the camera showed me why. Before Milton grew I use to be able to go up there and see great black skies. So unless something really bright and spectacular is happening there is going to e some night driving involved. Will post a pic later, too disappointed in the out come. That's too bad Jeff. I was out last night as well and actually managed to capture some decent shots. My issue is living close to Mount Hope airport and when I do time lapse I end up with plenty of trails through my images. Comet pretty easy to find and with my T2i I am able to capture some of the detail in the tail. You should not have to go too far up Appleby or even #10. By the time Orion comes up the comet is almost directly overhead. Pain to get setup but once you do and you work out the neck cramps you can pickup a fair amount of detail. I would have to look at my images to see the exact settings I was using. I forgot about the focus tip. Guess I will have to get back out there. Skeeter you gonna post a pic? Here you go. I got in late last night and have 190 images to wade through. That's awesome Skeeter. I feel I can see the tail across 2/3 of that picture. Nice. Thanks guys. You should be able to pick up more detail with a full frame camera Steve. With it being directly overhead light pollution still plays a role but not as bad. I can capture it from my deck, which is in the city, but get more detail from moving out into the country. Hoping for a clear night over the weekend. I went out on Sunday night with a friend and we took a few photos with my new camera (Sony a6000). Took enough photos to play around with that software Steve mentioned. Also attempted a few photos of the comet. For most of what I did I just used the regular lens, 16-50 set at 16mm. We couldn't discern the comet with the naked eyes, only when we took a photo and zoomed in on the screen did we know we had it. I think the moon was a bit closer and a bit brighter than would have been ideal. 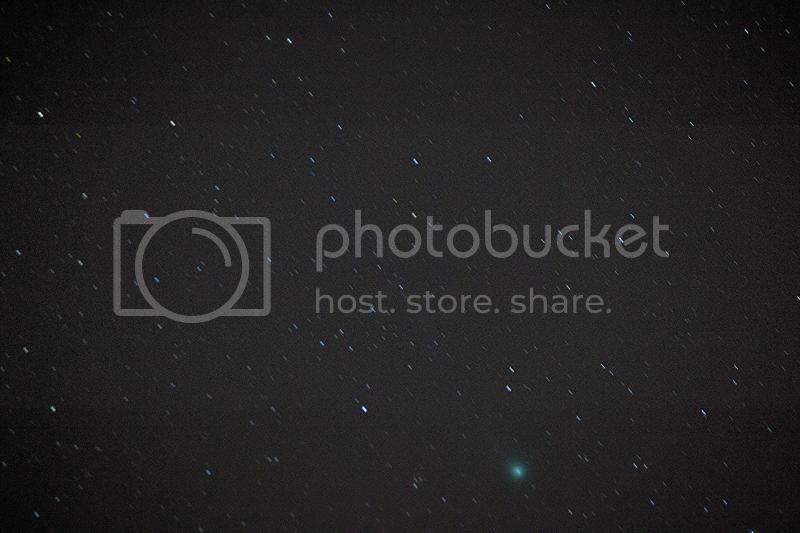 Here is one of the times I captured the comet. That was a 30" exposure (hence the star movement), f3.5, iso 4000. My friend (Rob of Eclipse Photography & Framing) was much more dedicated. He worked hard to center the comet in frame then zoomed in and progressed through 3 lenses until he was zoomed all the way in with a 300mm(?) lens. I haven't seen his results yet, but it took him about an hour to get the final shot. That snapshot was taken with my point & shoot since while Rob worked on getting that shot of the comet, I set the camera up to take a series of 30" shots so that I could play with the StarStax software Steve mentioned. I thought I had taken 50 or so shots, but it turned out to have been 10. So, I guess I better figure out better how to set my camera and remote so that it's doing what I think it's doing. It was a warm night (around 0C) but darned windy. That wind shook my camera the tiniest amount and made it feel a lot colder than it was. I learned a few things about photography in general and about using my camera, specifically. But I still have a lot more playing around with it before I can make it do what I want. We had parked ourselves along the North Saskatchewan River NW of Saskatoon about 40km; before the sun went completely down we used the valley in our shots. I might try HDR to get this image to look closer to how it did in person. It was a really nice spot and we'll likely head out there again, even just to snowshoe (if we get more snow). We did have just a hint of northern lights while we were out, and the camera did a better job of picking that up than my eyes did. Last edited by pawistik on January 27th, 2015, 12:40 pm, edited 1 time in total. Nice images Bryan. I thought about assuming that position for taking my images but the coyotes were too darn close when they were calling. As a matter of fact I had one check me out one night from only about 30 yds away. I found out mainly through trial and error and experimentation on how to capture stars at night. Nice capture on the northerns. The moonlight will be an issue now in attempting to get darker skies. Thanks for sharing.